Partner Representatives at the Fifth Meeting of Partners, December 2010. © 2010 Partnership for EAAF. 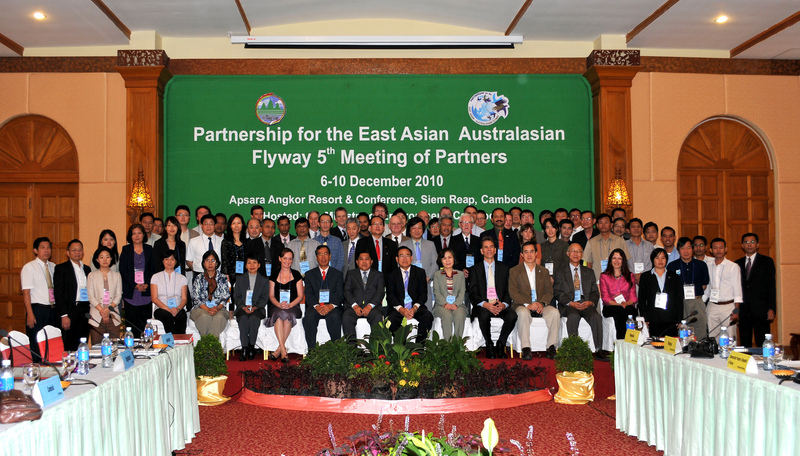 On 6-8 December 2010, the Fifth Meeting of Partners (MoP5) of the East Asian – Australasian Flyway Partnership was held in Siem Reap, Cambodia, with 60 international and 20 domestic participants. Senior Minister and Minister for Environment of Cambodia, H.E. Dr. Mok Mareth, welcomed the participants to the meeting. Meetings of existing Working Groups including Anatidae, Crane, Seabird, Shorebird occurred and a new Working Group on Communication, Education, Participation and Public Awareness was established. Task Forces on two focal regions – the Yellow Sea and the Amur-Heilong Basin – were established for further collaborative actions under the Partnership. Also, a Task Force to review the 2007-11 Implementation Strategy and draft a new version for the next term began its work. During the side event sessions, further discussions of the Spoon-billed Sandpiper, Scaly-sided Merganser and Colour Marking Task Forces took place. In adopting a proposal from the Monitoring Task Force, the Partners agreed to conduct a baseline assessment of the status of all Flyway Network Sites in 2011, using the BirdLife monitoring framework. Decisions made throughout the meeting gave direction to the Partnership, especially the Secretariat’s work plan, for 2011 and have given added momentum to the Partnership’s efforts on conserving migratory waterbirds and their habitats in the Flyway. Cambodia generously hosted two memorable field trips after MoP5: to the Prek Toal waterbird breeding colonies on lake Tonle Sap and to Angkor Wat. The Partnership is very grateful to Cambodia for its superb hosting of MoP5 and associated events. All files are in pdf format. Download the Adobe Acrobat reader.